We cannot underestimate the overwhelming impact the internet and social media play in our lives. Nonetheless, the TV, though an archetypal medium like the radio, still is an effective mode of entertainment. While a majority of the households have turned to cable or satellite, many still use antennas to receive the TV signals. Yes, I know, the term antenna sounds a bit like old technology. The good news is that the TV antenna has developed immensely in the last few years regarding technology. For instance, the range of the modern-day antennas has greatly improved, with a majority of the antennas able to send and receive broadcast information from anywhere between 40-100 miles or more at a clip. Moreover, the antennas are designed to receive UHF channels. Most importantly, having a long-range antenna will help to reduce fuzziness in images, improve the sound quality, and refine the signal quality overall. However, before we start reviewing the best long-range antennas, I’d like to table a disclaimer. During your search for the best antennas, you’re bound to come across websites with a list of antennas claiming to reach 150, 200 or 300 miles. I’m here to tell you that you’ll be hard-pressed to reach any of these distances. The truth is that the current digital transmission will begin to wane drastically after approximately 70 miles, and any reception received past that is iffy at the very best. The other reality is that though technology has greatly improved, big is still better. To receive a strong signal from long distances, you are best going with a bigger style antenna with multiple sensors, mounted at a sufficient height. Topping our list of the best long-range antennas is the 1byone with a maximum range of 85 miles. This antenna is tailored to receive a gamut of TV stations, including all the local stations, local sitcoms, kids as well as sports channels for the ultimate entertainment. This amazing outdoor antenna uses a coaxial cable for connection, and this will allow you to scan all the channels that you want. A majority of the 1byone users are impressed with this outdoor antennae, thanks to the list of channels that it allows you to access for free. Your little ones will enjoy an endless list of TV programs, while you get to enjoy your favorite sports or TV shows. And when it comes to performance, the 1byone does not skimp. For instance, if you’re looking to experience HDTV with superior picture and sound quality, the 1byone does more of what is offered by the conventional antennas. With this antenna, you can set it up anywhere, thanks to its easy set-up, be it in the attic or rooftop, it will allow you to experience wide berth of VHF and UHF channels. Finally, to the crux of the matter; many users can attest to the superior HD picture and Dolby sound that the antenna will provide. All this is further complemented by a robust construction and a cutting-edge design that will deliver a noise-free reception, regardless of the outdoor weather conditions. The Channel Master is my personal favorite and will hold up to the top 10 list of any reputable websites you’ll visit. Easy to identify, the Channel Master comes with a classical design inundated by an 8 Bowtie arrangement that will allow you to receive signals from 70+ miles of range. Designed to target the main DTV frequencies, this antenna will receive free over-the-air digital and HD channels without the need for you to pay any subscription fee. 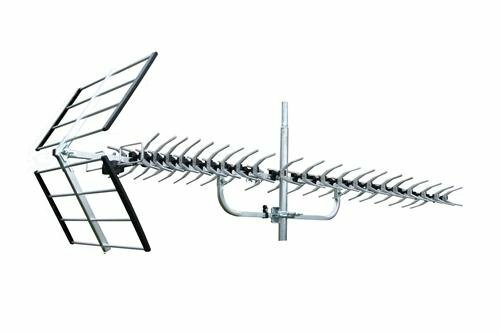 Using a multi-directional, eight-bay and phased array, this particular outdoor antenna can receive both digital and HD signals from a span of 180 degrees, and will even pick up some of the major channels such as ABC, FOX, CBS, PBS, and NBC. Also, users of this outdoor antenna will enjoy a generous bandwidth reception for 174 to 216 and 470 to 700 MHz More to this; the antenna will pick up UHF, VHF, FM, and HD channels with ease. Moreover, it comes with a 75-ohm coaxial output that allows you to receive crystal clear images and pictures without a hassle. So, whether you live in the rural areas away from your broadcaster, or don’t want to worry about signal issues, the Channel Master will surely provide amazing performance. Finally, compared to other models, the Channel Master comes preassembled, and it’s relatively easy to set it up compared to other models. If you’re in search of a compact, a sleek and aesthetic whole-house antenna that will allow you to mount it either indoors or outdoors, the Marathon CA is the right antennae for you. 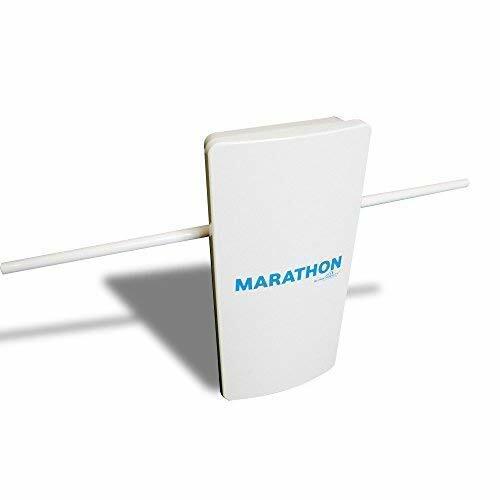 Combining advanced material construction plus an innovative RF circuitry, and the latest in RF TV antennae, the Marathon is tailored to capture long-distance signals better, especially in the difficult VHF spectrum. What I like most about this antenna is that it will eliminate the need for high-cost cables and satellites services. With a generous mile range of up to 100 miles, the Marathon can offer 3.5 Db gain and powerful 40dBi. Both these features are excellent, especially for those looking to receive broadcasting for their entire home and avoid purchasing several long-range antennae. And unlike a majority of the models, it’s extremely flexible and versatile at the very least thanks to its built-in amplifier that will allow you to connect it to multiple TV in your household. The versatility of the Marathon indoor/outdoor antenna goes beyond multi-use, but it also offers multi support for both VHF and UHV with HD display. Like the Marathon we’ve discussed above, the Mohu Sky 60 is yet another seriously nifty piece of kit. With this piece, Mohu has completely reimagined how an antenna should look and feel. For a start, the antenna is compact, super light, unobtrusive, thin and elegant. And it’s as tough as it is elegant, and will admirably stand up to the extreme weather including lightning. However, don’t let the compact size and shape, lull you into thinking the Mohu Sky is devoid of features. No, this piece of equipment is full of performance-oriented features that will allow you to have the best entertainment in your house. 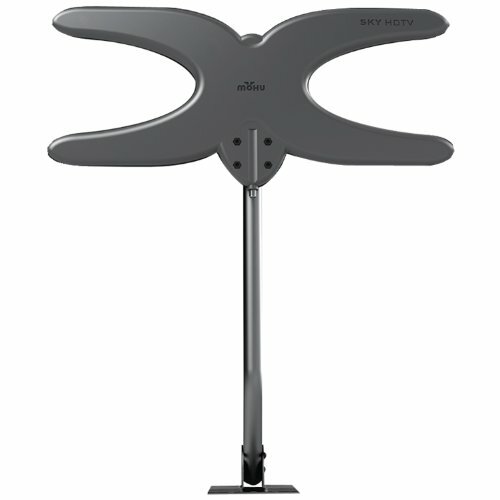 The Sky 60 TV antenna has been tailored for outdoor mounting and can reach TV signals from as far as 75 miles away. Beyond that, users of Mohu Sky will enjoy the proprietary “CleanPeak Filter” technology. This is a technology that will eliminate the noises and interference that comes from smartphones and other electronic devices signals and broadcast FM radio stations. With this technology in place, users are treated to crisp sounds and a signal that is clear as possible. More to this, the antenna can broadcast in 1080p HD for you and your family to enjoy moments of endless crisp and clear picture & video quality. Owing to its lightweight nature (3 pounds), this antenna is easy to install at the rooftop. Combining this with its multi-directional feature, the Mohu Sky will receive signals from about any direction. Featuring a traditional and highly-effective high-gain design antenna design, the Xtreme Signal Long Range Yagi will allow you to get more than 70 miles of reception of UHF content and high brand VHF at 25 miles. The Back reflector on this equipment helps in reducing the interference of the sound signal, thus allowing for a decent performance, and a majority of the users are amazed by the high-quality signal that the antenna offers. 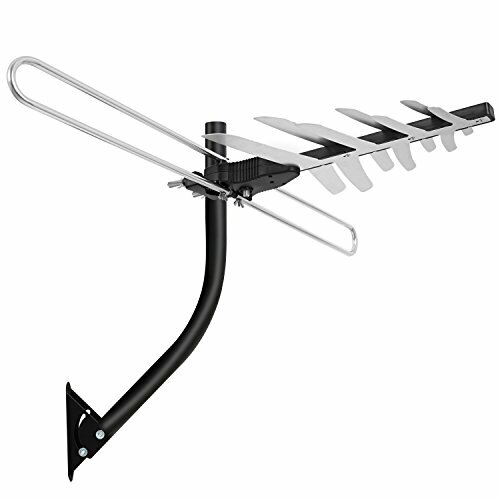 Besides performance, the Xtreme Yagi VHF/UHF HDTV antenna is a great option for those looking for as many free broadcasting channels, as it will offer a multitude of free HD channels in your location. In the Yagi package, you’ll also get mounting hardware that works with masts that are 1.6 inches in outer diameter and smaller. As such, it means that the antenna angle is adjustable. More to this, the Yagi antenna comes with a built-in transformer for a 75 ohm or coaxial connection for the ultimate signal strength. Finally, the model is robust and weatherproof. 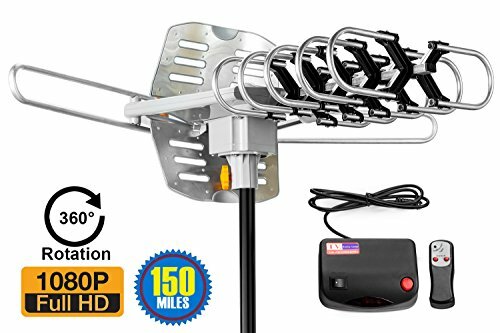 Long Range HDTV Antenna 200 to 500 Miles Range? Remember the disclaimer I gave at the beginning? At the moment, there’s no HDTV antenna with a range of 200 miles and over. In the section below, I’ve outlined models that will get you close to the 200 miles, and for now, you’ll have to cope with a lower mileage range. Longer range antennae are just a pipe dream for now. If you’re in search of a superb and easy to use an outdoor antenna, you can never go wrong with the ViewTV. Featuring a sturdy build, ViewTV can be installed outdoors, even on top of the roof as it’s weather resistant. And when it comes to broadcasting range, it can receive signals from a broadcasting signal that is far as 150 miles. Like a majority of the best long range antenna in our list, ViewTV will allow you to enjoy HD TV channels in 720p, 1080i and 1080p. Concerning VHF, it can operate with a frequency of 40~300MHz and UHF with a frequency of 470~890MHz. More to this, it comes with an inbuilt motor that will allow you to rotate the antenna 360 degrees. And when it comes to installation, you will simply need to use the included wireless remote control to move the antenna for the best signal. The 1Plus HDTV is probably one of the best antennae we’ve on our list. Like a majority of the antenna we’ve reviewed, 1Plus can be used outdoors and installed on your roof as it’s weather resistant. With a range of 150 miles, 1Plus can grab digital TV programming broadcast from distant sources, and you can even use it to access free HD TV signals. What we love most about this antenna is that it’s tailored to deliver full HDTV support, and is compatible with a plethora of platforms such as 720p, 1080i and 1080p. When using for the UHF channel, the 1Plus operates between 470~890MHZ and for the VHF, it operates between 40~300 MHz. Also, the antenna comes with a built-in high-gain amplifier that will allow you to use it on multiple TV devices. To avoid tangles, the motor rotates in multi-direction and the antenna at 360 degrees. Though the antenna cokes with a control box, you’ll need to purchase a pole for the proper installation. The McDuory is yet another simple yet effective TV antenna that should make into your list of the best outdoor range antennae. Aptly named the amplified digital HDTV antennae, this amplified antenna makes a perfect choice for anyone living far away from a broadcast tower, or you’re even unsure of the nearest TV tower. While it’s a perfect choice if you live close, but if you happen to live far away or somewhere in the middles, then you’ll need just to throw the McDuory, and you’ll be sorted. Like a majority of TV antennae on our list, the Amplified McDuory comes with a built-in high-gain that will allow you to connect to two tvs in your homestead. And when it comes to range, the McDuory has a generous range of 150 miles. Don’t have tools for installation? Or are not a DIYer? No need to worry as the McDuory is a tools-free antenna that will allow you to easily install it without needing any tools or expertise. Its major selling point, which also happens to one of its best features, in our opinion at the very least is the 360-degree motor rotor that can be controlled 100% through remote control. The benefit of the above feature is that it will save you a trip up the ladder and onto the roof. Given its super weather resistant, the McDuory will withstand anything that Mother Nature may throw at it, including the storms and winds. Overall, the McDuory is an excellent weather-resistant antenna that will provide you with a remarkable performance at a budget-friendly cost. 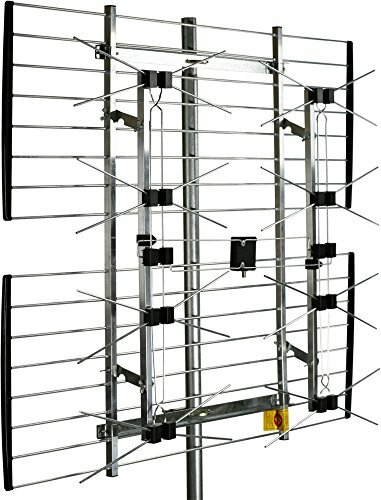 Access to More Channels: Unlike your regular HDTV antennae, Long range antennae will allow you to pick up more channels as they extend further. While the number of channels is determined by a myriad of factors, it’s with no doubt that the long-range antenna will offer a greater number of channels compared as opposed to a regular or short range antenna. Local TV broadcasts are everywhere: Agreeably, big cities offer an extensive range of broadcast, but fortunately, an increasing number of channels are setting up their masts everywhere, meaning that even if you don’t live in the city, you can still get access to some TV stations. OTA TV signals offer excellent picture quality: While cable and satellite provider will offer hundreds of channels, they employ compression and other techniques to their signals, all which compromise on picture quality. Best for rural areas: A majority of the population lives in the rural areas, outside the cities. Here, the TV station is far apart, and receiving signals can be quite a challenge. However, the best long range TV antenna provides an answer to this common problem, and they will allow users in the rural areas to access TV channels of their choice. Most people often spend a significant amount of their time relaxing in front of the TV. After a long day at work or school, it makes sense to get comfy in your favorite coach and relax as you get entertained by the programs on your TV. It is quite unfortunate that it can be a challenge to get a reliable signal, especially to those living far away from the broadcasting station. The good thing is that a long-range TV antenna can greatly help in improving the fuzzy quality of your image. However, as it turns out, choosing along range TV antenna is easy said than done. There’s an extensive range of different antennae in the market, and it’s crucial that you find the right one to ensure that you’re able to get the best long range antenna. To do so, there’re factors that you need to consider, and in the section below, we shall outline all these factors. The first step before making any purchase is figuring out which channels are available in your locality and those that you want to watch. To find out, you’ll need to head over to TV Fool. TV Fool will pair the FCCs broadcast TV database with topographical maps and provide you with a pretty detailed estimation of which signals that will reach your house and how strong they will be. The TV Fool will allow you to enter your house address in the search box, and get a tabular result with the channels at the top having the strongest signal and those at the bottom with the lowest signal. The next step is figuring out what station you want to watch. After all, there’s no point of wasting time to get weak stations if all your favorite shows are on strong ones. An easy way of doing this is by checking a TV listing guide to see everything that’s on the air in your locality and make a listing of your offered channels. You’ll probably have to enter your zip code to get an accurate and relevant listing. While at it, it’s crucial that you choose “antennae” or “over the air” as your TV provider in the online program guide to avoid mixing your list with cable channels. Nothing is more devastating than setting up a new antenna and installing it, only to realize that it cannot receive a strong enough signal. Therefore, it’s crucial that you take into account the expected range of your antenna before making any purchase. While all the long-range antenna is great for a longer range, their performance greatly varies as some can receive reception from farther distances than others. This should not be a guessing game. However, finding which are ideal for your location should be easy. You can first read through their descriptions, or if need be, call the seller directly and ask. In most cases, however, most of the users find the sweet spot for an antenna with a range of anywhere between the 45-150-mile range. Antennae are available in a gamut of styles and types. Therefore, before getting too serious into deciding which type of antenna to buy, it’s crucial that you have a rudimentary understanding of what is available. Generally, the two types of antenna are omnidirectional and multidirectional TV antenna. Omnidirectional, also known as directional outdoor TV antenna points to a single direction in a bid to improve the signal from that specific direction. 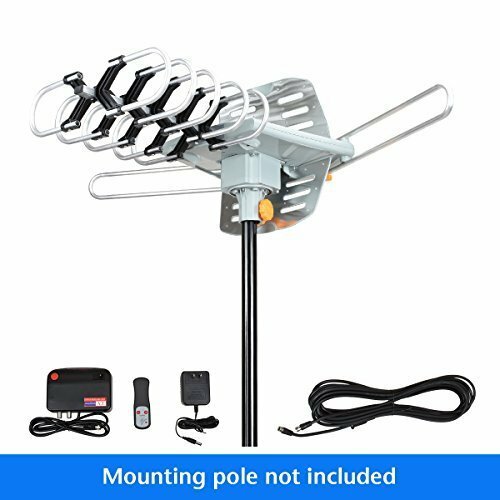 On the other hand, the multi-directional outdoor TV antenna is not fixed in a specific direction but instead can receive signals from different directions at the same time. 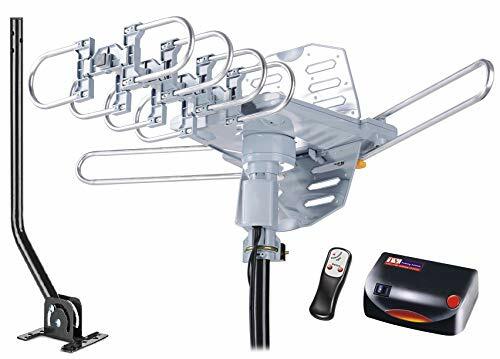 In our opinion, it’s suggested that you go with the multi-directional outdoor TV antenna, especially if the channels you’re looking forward to watching transmit from various directions. Again, when it comes to the type, you’ll have to choose between the outdoor and indoor antenna. As their name suggests, outdoor antenna is placed outside, while the indoor antenna is placed inside your house. An indoor antenna is less effective since your roof will act as a barrier, and unless you live near a TV broadcast tower, you should consider an outdoor antenna. Otherwise, you won’t receive a strong signal with the indoor antenna. In any case, because you’re concerned with a long-range TV antenna, an outdoor antenna should be the ideal choice. With an outdoor antenna, you can mount it on your roof, where it will have a better line of sight straight to the broadcast tower. A majority of the antennae are tailored to pick up UHF channels, which makes sense since the band has many channels. However, a majority of the good quality long range antennae are capable of picking both UHF and VHF. To get the best signal, there're various measures that you should follow. By the end of this article, I know you’ve already made up your mind to say goodbye to the rip off of a cable package that routinely chips of your bank balance every month. Instead, you can now welcome the modern, reliable and easy way of the long-range outdoor antennae that will provide you with a gamut o channel at absolutely no cost, save for the initial cost and installation cost. And fortunately, we’ve provided you with a list of the best long range TV antennae, in the market. So, what are you waiting for? Go for one.